It was the unsavory side of professional cooking that attracted me to it in the first place. In the early seventies, I dropped out of college and transferred to the Culinary Institute of America. I wanted it all: the cuts and burns on hands and wrists, the ghoulish kitchen humor, the free food, the pilfered booze, the camaraderie that flourished within rigid order and nerve-shattering chaos. That essay, “Don’t Eat Before Reading This”—which is an eloquent, highly recommended read, by the way—ran in the magazine in April of 1999, and the following year it was adapted into a bestselling memoir, Kitchen Confidential. That book established Bourdain as a “bad boy” of the culinary world, a tattooed, foul-mouthed ex-addict who despised pretension and what he saw as the empty commercialism of celebrity-chef culture. In 2001, he followed up Kitchen Confidential with another book, A Cook’s Tour, which was released alongside a TV show of the same name produced by the Food Network. He would continue to refine that formula over the next 16 years, in a series of globe-trotting travel shows for the Travel Channel (No Reservations, 2005-2012, The Layover, 2011-2013) and later CNN (Parts Unknown, 2013-2018). On his shows—in which he was an active, creative force, writing voice-overs, scouting locations, and working with cinematographers as well as appearing on camera—Bourdain advocated for so-called “peasant foods,” positing that a good meal eaten on a plastic stool is as worthy of respect as an expensive gourmet tasting menu at a Michelin-starred restaurant. In 2016, the show scored its biggest guest yet: then-President Barack Obama, who joined Bourdain for a simple meal of pho and beer in Hanoi. We spent hours eating and drinking and talking about a shared affection for a “dirtier,” more natural, more reactive shooting style, all while sitting in Hong Kong’s dai pai dongs. These casual, open-air food stalls represent the way the city used to eat. At dai pai dongs like Keung Kee Dai Pai Dong in Sham Shui Po—a traditional, less affluent, dense section of the city—cheap, delicious food is served. Pull up a plastic stool, crack a beer and fire up the wok. He also emerged in the last year as an outspoken ally of the #MeToo movement, fearlessly criticizing powerful men in Hollywood and in the culinary world for their complicity in the culture of sexual harassment and assault that has marred those two industries. Bourdain is survived by Argento, whom he had been dating since last year; his 11-year-old daughter Ariane, for whom he wrote a cookbook in 2016; and his two ex-wives. 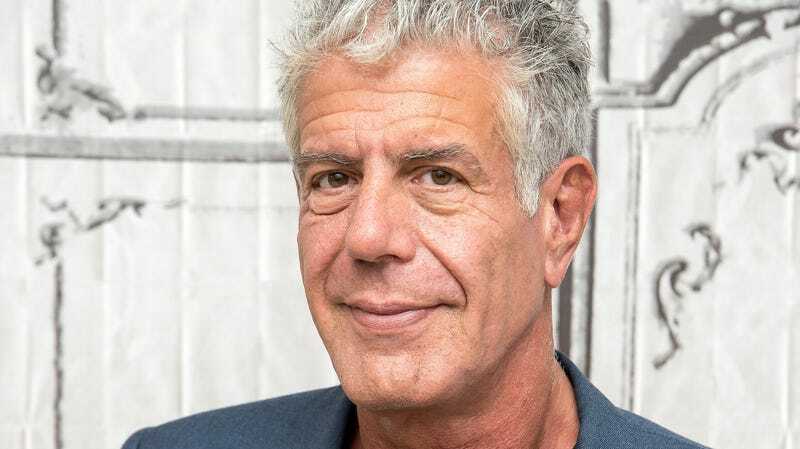 Sean O’Neal spoke to Bourdain for The A.V. Club for a typically funny, insightful interview in 2008.